Because I'm a sucker for all things Christmas, when you throw in a way to combine it with being a little healthier, I'm in. Today I began participating in the Elf for Health challenge!! I have been partnered with another awesome elf, and I am excited to get to know her better while we cheer each other on through the daily challenges. You can find out more about the challenge HERE. And it isn't too late to sign up to participate. Elves are reassigned every two weeks, so you can join in for Round 3! This morning I worked up my thirst by running 6.25 miles outside in the snow. I can't begin to tell you how much I loved this run. I absolutely love running in the snow. I don't mind that it takes a mile for my face to stop stinging or two miles for my hands to warm up. I love how quiet the world gets when it snows. How peaceful it is. How even the ugliest neighborhood can look beautiful. 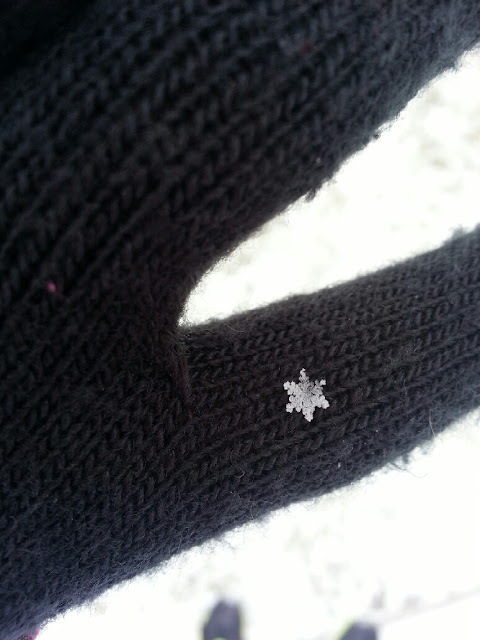 At every stop light during my run, I would look at the tiny snowflakes that would land on my gloves. Snowflakes are amazing. Seriously. You can forget about stopping to smell the roses. Next time stop and look at the snowflakes. That picture is VERY cool! I'm with you on the snow thing. I love running in it! Especially if I go to a pathway off the road. People are crazy drivers in the snow!! Elf for health looks pretty fun! I've never run in snow but hope I will get my chance one day. Year-end life caught up with me so I haven't participated Like I hoped I would. I love the snowflake photo! I love the snow and snowflakes!! SO jealous please send some my way we are in desperate need!